Summer’s back! As much as I hate Dubai’s burning (literally) heat, I do enjoy bringing back tan in my makeup and softening my makeup. Unfortunately, that is not what this post is about (Sorry about that :P). 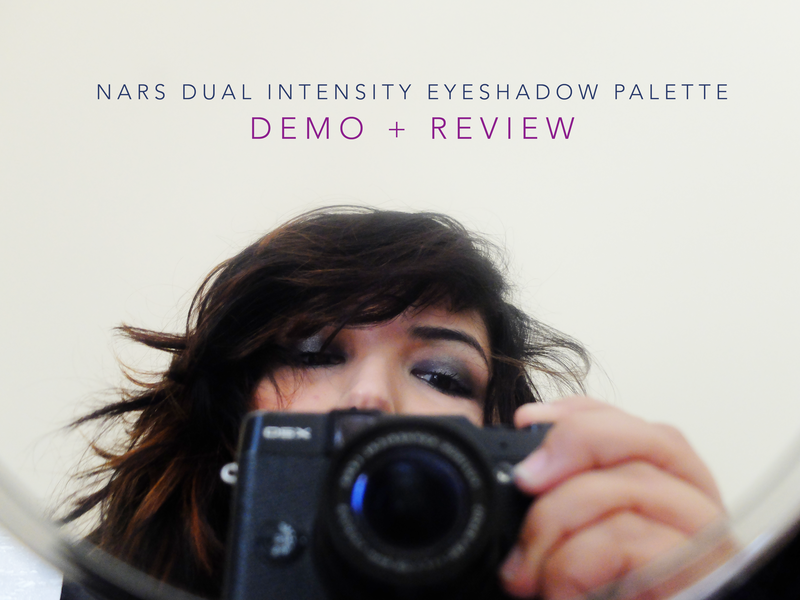 I got my hands on the new Nars Dual Intensity Eye-shadow Palette and here’s my last ode to a wintry cold look, well, for this year anyways. If you’re a Lorac Pro shadows lover or enjoy the newest Hourglass Ambient Lighting Eye-shadow Palettes, the texture of this is on the other end of the spectrum i.e. DRY. They are not buttery in texture and require a heavy handed blending. I’d reckon, start sheer and build up the shades ensuring that they blend seamlessly. When you wet the shadows, the intensity is x2, but blending becomes harder, so follow the sheer steps and you should be fine. Be warned, the formula needs some adjusting time, but once you get a hang of the shadows, they are beautiful. These are seriously pigmented and the slightest stroke brings out the best in pigmentation. Because of their wet/dry formulation, I love using my finger to apply these and then blend out with a MAC 217, if you start off with a brush, it is actually harder to build up the color. The palette comes in 8 stunning shades in a glass packaging on the outside. Imma be honest, it’s not the most practical, but it works as a great accessory on the dressing table. The shades it comes in are: Europa (Light coral), Andromeda (Champagne), Himalia (Warm Brown Bronze), Lysithea (Bright Silver), Ursa Major (Chocolate Brown), Giove (Royal Blue), Subra (Burgundy Purple), Sycorax (Black). Needless to say, all of these have a slight shimmer hint. I started off by taking Ursa Major (DRY) on my eyes and blending it towards the crease. I built up 2 layers of intensity and added Giove (WET) towards the inner part of my eye, bringing it till the center of my lid. I built up a couple of layers to intensify the blue and added Lysithea in the center of my lid. A last touch of Sycorax was added to the end of my eye to bring out more definition. On my bottom lash-line, I’ve used Lysithea and Giove alone. I added heaps of my L’Oreal mascara and viola!